The need for food is a basic requirement for human survival, and it adds to a person’s wellness. In addition to its natural life sustaining provisions, it is also a source of contentment and enjoyment. A man or woman is able to receive happiness and gratification through various tastes, smells, textures, etc. 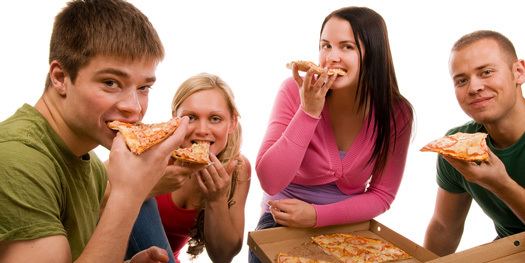 Unfortunately, food can be abused just like illicit drugs, and a person can eventually develop a food addiction. There is research-based evidence that suggests foods high in sugar, salt, and/or fat can trigger the pleasure sensors (dopamine, serotonin, endorphins, etc.) in the brain creating strong feelings of pleasure and satisfaction. This response is similar to a cocaine addict, whose reward center is turned on when abusing cocaine. When a person becomes addicted to the “high” that is felt while eating particular types of food, the man or woman suffering from the addiction will continue to eat even when they are no longer hungry. This in turn creates a nasty progression of food addiction. As the cocaine addict continues to abuse the drug in order to feel the high (intense euphoric feeling), so does the individual who continues to binge upon foods that induce pleasurable feelings. This person will eat in excess and eat much more than what is necessary for healthy living and proper nutrition. The continued abuse of food will lead to physical, emotional and social penalties such as obesity, heart disease, depression, low-self worth and isolation. Like the drug addict, the food addict will constantly engage in the destructive behaviors of overeating and gorging on food to induce the endorphin rush of feeling pleasure. It is imperative that a person who has developed a food addiction seek professional help. Up to 50% of individuals with eating disorders also struggle with substance use disorders and up to 35% of individuals with substance use disorders also have eating disorders; Bulimia Nervosa being most commonly linked to substance abuse. The findings of the National Center on Substance Abuse indicate both have shared risk factors and characteristics. The DSM IV-TR diagnostic characteristics of Substance Dependence as well as the proposed criteria for Binge Eating Disorder (now included in the DSM-V) are discussed with respect to behaviors surrounding food and eating. Research has indicated that the brain reward system processes positive responses to both food and addictive substances. Due to the many similarities between eating and addictive disorders, the recovery and 12 step models used in substance abuse treatment can be used effectively with eating disorders. Dr. Kim Dennis is an award-winning board-certified psychiatrist who specializes in eating disorder treatment, addictions recovery, trauma/PTSD and co-occurring disorders. As CEO & Medical Director at Timberline Knolls Residential Treatment Center, she supervises the medical staff and sets the overall vision and direction for the treatment program. Dr. Dennis maintains a holistic perspective in the practice of psychiatry. She incorporates biological, psycho-social and spiritual approaches into the individually tailored treatment plan for each resident. Obtaining further information about food addiction is helpful in better understanding this condition and those who it can potentially affect. An increasing number of scientific studies suggest that food, like drugs or alcohol, can have addictive qualities . Human genetic research, animal studies, brain imaging and biochemical studies of the digestive processes all indicate that some people could experience addictions to food . According to estimates by David Kessler, professor at UCSF and former commissioner of the FDA, there are more than 70 million food-addicted adults in the United States . Animal studies have indicated that drugs of abuse increase levels of dopamine in part of the brain, activating the reward system, which is likely what is mimicked in a food addiction . About 50% of the obese, 30% of those overweight, and 20% who are at what are considered a healthy weight, are actually addicted to a specific food, combinations of foods, or a volume of food in general . An estimated 400,000 adult deaths each year in the United States are associated with obesity. Total costs, which include medical costs and days lost from work because of illness, disability or premature death, from obesity in 2000 were estimated to be $117 billion . A food addiction is often developed due to the result of various factors that include biological, psychological, or social reasons. Biological causes can consist of hormonal imbalances, brain chemistry abnormalities, medication side effects, or an inherent disposition resulting from family members struggling with food addictions. Some psychological factors may include emotional, physical or sexual abuse, experiencing a traumatic event, unable to effectively handle negative situations, persistent low self-worth, or dealing with grief or loss. These mental issues can lead a person to turn to food for comfort or to numb emotional pain. Dysfunctional family problems, peer pressure, child abuse and stressful life events are a few social factors that can lead to a food addiction. Food addiction can also co-occur with other disorders such as depression, eating disorders or substance abuse. It is recommended that professional assistance be sought to learn how successfully to manage this disorder. When someone has developed a food addiction, the individual will present numerous signs and symptoms that can be recognized. If you or someone you care for is experiencing any of these signs of food addiction, then find professional treatment immediately. The repercussions a food addiction may have on various facets of your life can be overwhelming. A food addiction, if left untreated, can quickly begin consuming and ruining your life and health.Knowing how a food addiction can change and destroy your existence may help other to seek the assistance needed to begin living a healthy lifestyle again. If you or a loved one is fighting a food addiction, then you all too well understand the emotional lows of despair, frustration, and hopelessness involved in the addiction. Healing for a food addiction is available. By seeking the appropriate help and care you need, you can begin to enjoy a life full of freedom from addiction. There are dedicated food addiction treatment centers that can facilitate your holistic and comprehensive approach to managing this disorder. A food addiction rehab facility will be able to assist in overcoming the psychological issues and physical concerns that help lead to a food dependency. You can defeat a food addiction, but you have to ask for help first. : Thompson, J. Kevin. Handbook of Eating Disorders and Obesity. John Wiley & Sons, 2004. Speaking from my personal experience, there is always some underlying emotion that makes one eat and eat even when we know we should stop. Speaking from my own battles with food addiction I have come to see that in most cases there is an underlying emotion or frustration that causes one to eat and eat even when we are full. Thank you so much for your great feedback, Meljay and for your readership of our articles! We appreciate you being a friend of Addiction Hope!